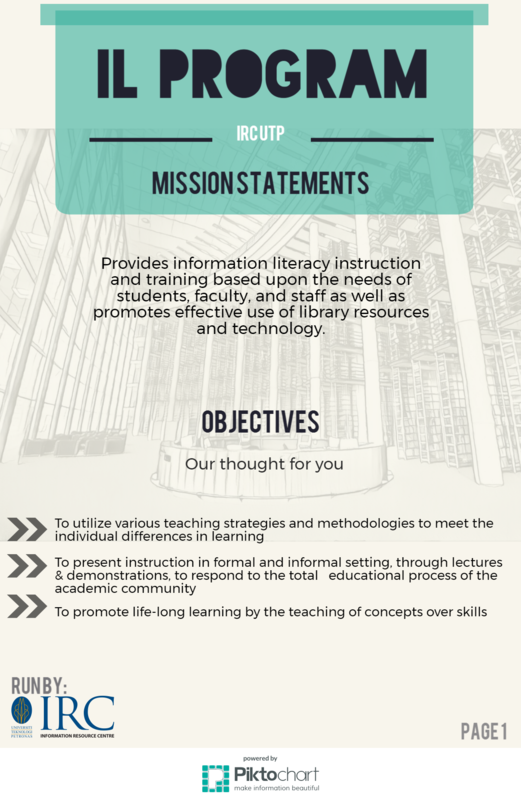 Provides information literacy instruction and training based upon the needs of students, faculty, and staff as well as promotes effective use of library resources and technology. · To promote life-long learning by the teaching of concepts over skills. Individuals and organization in today’s Global Information Society needs to master various kinds of critical information skills and competencies. None is more important than Information Literacy and life-long learning. Mastery of these skills will enable people and institutions both to succeed in a constantly changing and challenging highly competitive world. Only information literacy can enable people to stay ahead of competition and change. 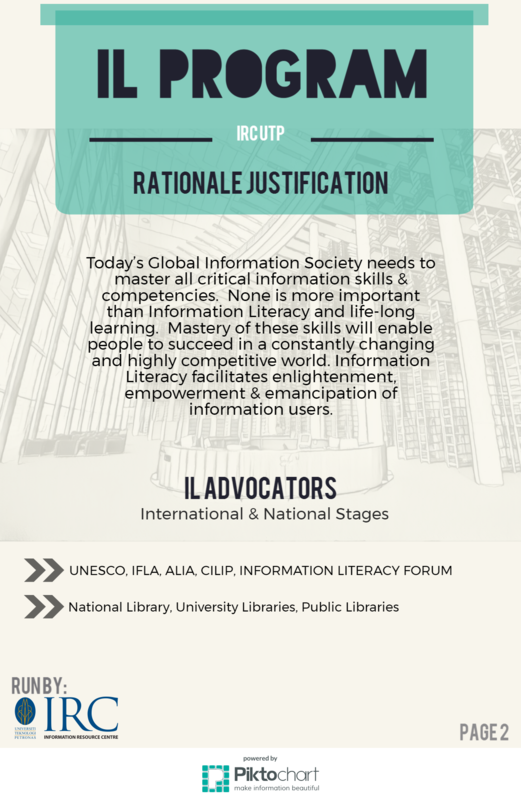 Information Literacy facilitates enlightenment, empowerment, and emancipation of information users. Critical thinkers and independent learners are the expected outcomes of an information literate person. 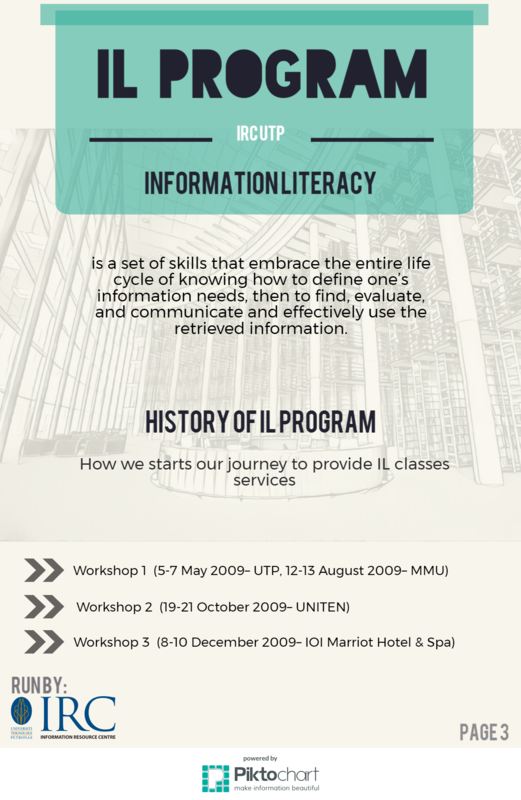 Information Literacy is a set of skills that embrace the entire life cycle of knowing how to define one’s information needs, then to find, evaluate, and communicate and effectively use the retrieved information. Information Literacy is, in turn, the keystone to life-long learning. An information literate individual is a self-directed individual capable of knowing how to master life management skills. 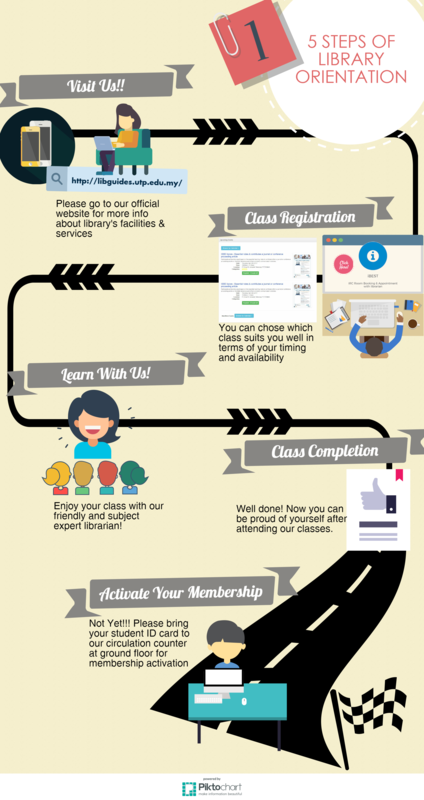 In most develop countries librarians, educators and other information professionals play a pivotal role in equipping individuals with information literacy skills, as well as furnishing them with critical opportunities to survive and thrive in this era of fierce competition. Information literacy has been defined as the ability to access evaluates and uses information from a variety of sources. Recognize the need for information. Recognize that accurate and complete information is the basis for intelligent decision making. Recognize point of view and opinion versus factual knowledge. Rejects inaccurate and misleading information. Integrates new information into an existing body of knowledge. Applies information in critical thinking and problem solving. To be information literate, a person must be able to recognize when information is needed and have the ability to locate, evaluate and use effectively the needed information. Ultimately information literate people are those who have learned how to learn. They know how to learn because they know how knowledge is organize, how to find information, and how to use information. Provides information literacy instruction and training based upon the needs of students, faculty, and staff as well as promoting effective use of library resources and technology.